Idiopathic intracranial hypertension (IIH) or benign intracranial hypertension is a neurological syndrome characterized by elevated intracranial pressure. This uncommon disorder occurs primarily in obese women aged 10 to 50 years, sometimes in association with endocrine and metabolic dysfunction, with systemic diseases or when treated with multiple medications. We describe a case of IIH in a 43-year-old woman with schizophrenia treated with risperidone, demonstrating a typical clinical picture of benign intracranial hypertension. For the 5 years of treatment with risperidone she put on 35 kg in total (BMI> 35); for the last 2-3 months she began to complain of visual obscurations, nausea with vomiting. Ophthalmoscopy revealed bilateral asymmetric papilledema (OD>OS). Magnetic resonance imaging was normal, intracranial pressure was elevated IIH was diagnosed. Risperidone was discontinued and replaced with Seroquel 200 mg daily. Treatment with furosemide and mannitol 10 % was initiated. Papilledema resolved completely over the next 2 months. The patient was followed-up for four years after risperidone withdrawal. Weight loss of 28 kg was noted for four years. There were no relapses of headache, nausea, visual obscuration. Ophthalmologic examination revealed no papilledema. We suggest that prolonged use of antipsychotics, such as risperidone, should require proper surveillance for possible development of IIH and routine ophthalmologic examinations should be performed. Key words: Idiopathic intracranial hypertension, Benign intracranial hypertension, Risperidone, Weight gain, Schizophrenia. Please cite this article as: Tzoukeva AJ, Deleva NS, Kaprelyan AG, Dimitrov IN. IDIOPATHIC INTRACRANIAL HYPERTENSION IN A WOMAN WITH SCHIZOPHRENIA. J of IMAB. 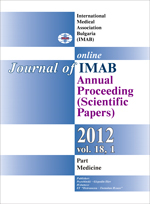 2012; 18(1):206-208. doi: 10.5272/jimab.2012181.206. 7. Friedman D. Papilledema. In: Miller N., Newman N., Biousse V., Kerrison J., eds. Walsh and Hoyt’s Clinical neuroophthalmology, 6th ed., Philadelphia, Lippincott Williams & Wilkins, 2004 (3):237-291. 17. Wall M. Idiopathic intracranial hypertension (pseudotumor cerebri). Curr Neurol Neurosci Rep. 2008 Mar;8(2):87-93. [PubMed].